Did Google just release Google Photos for Windows 10? A search for Google products on the official Microsoft Store returns only a few hits. There is Google, a search app for mobile devices or YouTube for Xbox One but the apps have not been updated in quite a while. Google ignores the Microsoft Store for the most part which is why users won't find official company applications for Gmail, Google Photos, Google Drive, and other company services and products on the Store. Update: Microsoft removed the application from its Store. 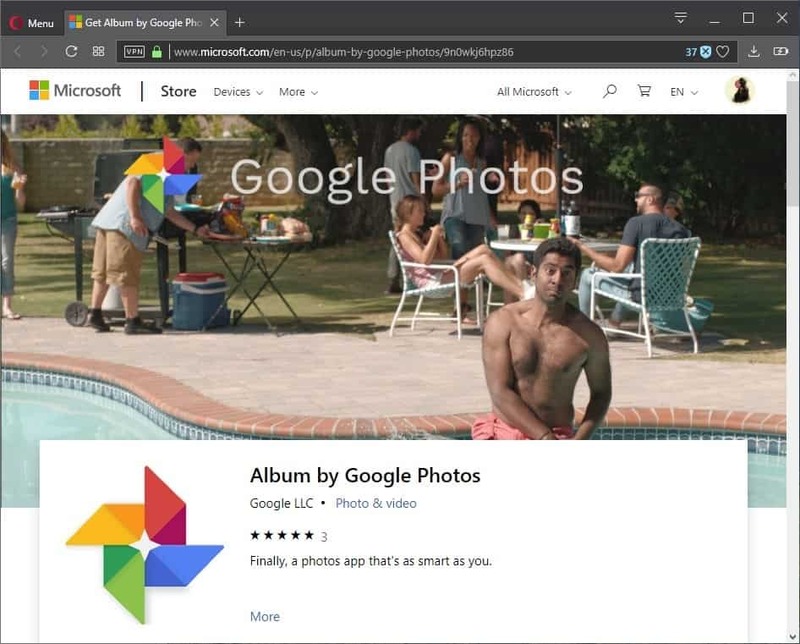 It is surprising therefore when an application like Album by Google Photos lands in the Microsoft Store especially if the producer is listed as Google LLC. There are indicators that this may not be the case. Google's official Microsoft Store account is Google Inc. and not Google LLC. If you check the few apps that Google released over the years, you will notice that it always used the Google Inc. account and not Google LLC. Google itself has not announced the application on any official channel. The Twitter account GooglePhotos makes no mention of it, and there is no indication on any company blog that Google released Google Photos for the Microsoft Store and Windows 10. It seems likely that the app is not official; this would mean that a third-party developer managed to sneak in an application as Google LLC. We contacted Microsoft and Google about the application but have not heard back yet. We will update the article with information as soon as they become available. Now You: What is your take on this? Legitimate app or not? Album by Google Photos is a new application by Google LLC for Windows 10; is it a legitimate application or fake? In the Android Play Store, Google’s applications are also published by Google LLC. Maybe they decided to change that in the Microsoft’s Store as well. If it’s true, the only sad part is they went the UWP route. It’s not like Google can’t afford to make proper Win32 programs. Sounds plausible that this is not the official Google account because the change that they will create something new name wise is not a smart brand recognizable strategy wise speaking. Next, to that do you think that Google will be so bold to advertise with a picture with somebody even with a towel wrapped around, him in a swimming pool? Especially lawsuit wise this is not smart on a moment that the world is back being on a point where even the slightest hint sexuality wise is unwanted. Next to that Google shareholders might also think that on this point of time where statistically the world population is being even more conservative as back in the (Goold old) dark ages, is too bold of a statement. But how is this name new when they also use Google LLC in the Play Store on Android? Have anyone signed in to it? Look at the font in the banner. It’s fake. This is not an official app. I downloaded today, and when I opened I got a recorded message telling me that I have a virus, stating not to reboot the computer as it was now blocked. It then stated that I had to relog into my Microsoft account as well as my google account. The message stops when you close the app. I have reported this to store and removed the app. Searching with Chrome on “google-llc” shows the argument may be valid, if not the application in question. The grammar in the description is not flawless, and overall it looks like some amateur pieced it together. Not something Google would write. This one smells fishy all the way. The image is also a dead giveaway, HORRIBLE choice. Will follow this story as it unfolds.. Will they blame Google or Microsoft this time..
You may like to read the announcement again. Google+ is destined for the chopping block for non-commercial users. There is no mention of Google Photos being shelved. Looking at the past Google products, it’s not really convicing. They were suddenly retired or being branched to something else with inferior functions. On August 10, 2015, Google announced plans to reorganize its various interests as a conglomerate called Alphabet. Google became Alphabet’s leading subsidiary, and will continue to be the umbrella company for Alphabet’s Internet interests. Upon completion of the restructure, Sundar Pichai became CEO of Google, replacing Larry Page, who became CEO of Alphabet. On September 1, 2017, Google Inc. announced its plans of restructuring as a limited liability company, Google LLC, as a wholly owned subsidiary of XXVI Holdings Inc., which is formed as a subsidiary of Alphabet Inc. to hold the equity of its other subsidiaries, including Google LLC and other bets. A check under google security verified the login on the Albums by Google Photos program as a new sign in. Album by Google Photos doesn’t appear in the first three pages of a search using Google, just Google Photos, which appears in almost every hit. Anyone home at Google? No, just us bots! The fact that we’re questioning and unable to independently verify the legitimacy of the software’s author tells you everything you need to know about the microsoft store. The Google app has the menu item for it to load google photos, gmail, voice, drive, etc. QED is an abbreviation of the Latin words “Quod Erat Demonstrandum” which loosely translated means “that which was to be demonstrated”. For me the fellow posing in the pool (could be Sundar Pichai meme?) has a ridiculous idiot look. Pair this with the text in the description “Finally, a photos app that’s as smart as you.” and I flagged it as a fake. As other’s have noted there’s some other giveaways too.